West Berkshire - Maharaja IPA 5.10 Last one out from two pumps to get a pint. More mud but tasted O.K. Wantsum - Montgomery 4.00 Not Tried A pint of mud. Returned and exchanged. Early afternoon visit and fairly busy. It was reassuring to see this place busy as all the other pubs that I had visited seemed to be empty. The Tuesday steak offering seemed to be very popular. Adnams - Bodebrown Brewery Cerveja Curitiba Brazilian Pale Ale 5.00 Very good condition. Greene King - Abbot Reserve 6.50 Not Tried I must try this sometime. Afternoon visit, good service at the bar. I sat and read the summer edition of Wetherspoon's in house magazine. Last stop on Ian and my 5 pub tour of the centre of Ashford. Not overly busy for a 'spoons on Saturday night but then it wasn't playing any World Cup games. We sat in a booth. Early Saturdsy evening and packed. A queue at the bar but service was surprisingly quick. Beer list as below plus the standard offering. Nottingham - Rock Mild 3.80 A proper Mild in good nick. Afternoon visit about tea time. I was disappointed to find that most of the beers that I would have liked were labelled as available soon. Early evening and as busy as expected around the bar but quiet towards the rear of the pub. Late afternoon - got served immediately! Just noted beers had plus 1. Maxim - Azacca Pale 4.30 Rather bland. Fairly busy for a late Monday evening. 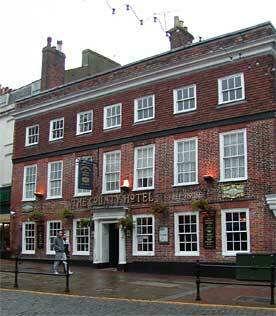 The pub is found in Ashford, Kent, TN24 8TD. 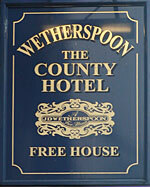 Typical Wetherspoon's drinking hall. Just about the only place where you can get a decent pint of real ale in Ashford. Marston's Bitter and Pedigree, Greene King Abbot Ale and Shepherd Neame Spitfire. Also 1-4 guest beers. Leffe, Hoegaarden and Staropramen on draught added recently. Guest beers are normally the best bet. 2 banks each of 4 handpumps on the higher level bar and 6 handpumps on the lower level. We have visited this pub 305 times, seen 430 different beers and tried 347 of them.